Home / Blog / Tempo Traveller Hire in Bhubaneswar For a Comfortable Journey! During long distance journey, it’s very important that, the vehicle you use should be very comfortable. Well mostly we plan a tour with our near and dear one, the people those are very close to us and the main reason behind the journey is to spend quality time with people whom you love. 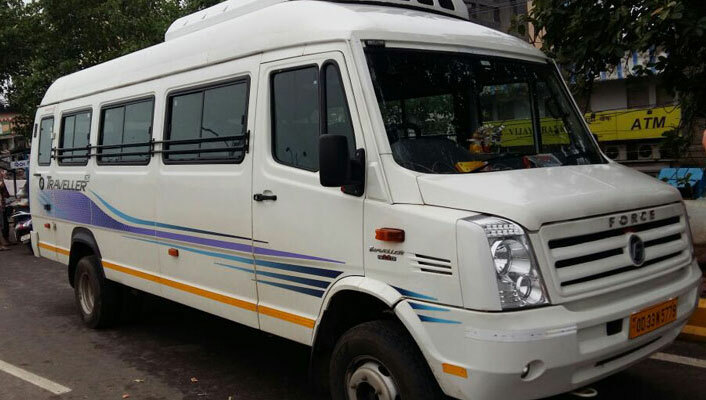 So if you want to make your journey memorable then Tempo Traveller Hire in Bhubaneswar and I are sure you get a very comfortable and enjoyable ride. Let’s discuss more on this topic. Well tempo is a vehicle that carries 12 to 18 people in it easily and for keeping things there are lots of spaces where you can keep your, food, clothes, and other necessary things those you need in your tour and travel journey. So this vehicle is a perfect transportation vehicle for tour and travel lovers. Also another important thing is the cost and availability, tempo is less costly in comparison to bus, if you hire a bus for tour and travel then it becomes very costly for you, also you face difficulties in parking and other things, but in case of tempo you can easily hire any time you want because its mostly available 24×7 for booking, also its cost is less in comparison to bus, so it is suitable for tourist. Every year thousands of tourist book tempo in Bhubaneswar to explore Bhubaneswar and nearby cities top tourist destinations. From Bhubaneswar to Puri and Cuttack these tourist destinations of Odisha are very important and tourist love to visit, and for this tempo is a perfect vehicle. So if you want to book a tempo for tour and travel journey then explore on online and book a perfect match for your need.